Hospitality requires a range of qualities and commitment well beyond those needed in main stream business. Glenn Austins' skill is 35 years in the making, he is a leader ,the first Australian to sit on the World board of Chefs and Honorary Life president of the Australian Culinary federation. He is unique, creative and pragmatic in business development solutions with an ability to sift through information and efficiently formulate results. A commitment to client satisfaction and working towards a strategy of high return and problem solving is a given. The constant success of Glenn Austin Global Hospitality Consultants is directly related to the continuous commitment and Glenn’s ability to deliver results and perform in a client’s business environment. Glenn’s success is built on a genuine and extensive experience base of QSR, hotel chains, recruitment, training and food manufacturing, together with several layers of long term industry and business contacts .His knowledge and professional affiliations are strong and flexible and his team manage to deliver solid results for all of his clients. Glenn is recognised globally in many markets as an important and influential service to the food industry, working locally and internationally for well over 3 decades in several markets including all South East Asia ,North and South America, the Pacific and of course Australia. His achievements are a result of his persistence, knowledge, skill, energy and effort. 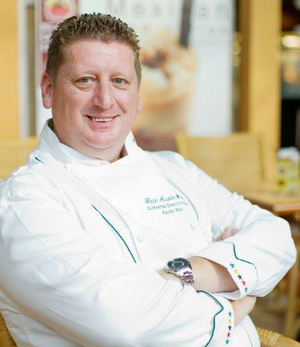 Global Executive Chef Bega Cheese Ltd. Ambassador to the Thai Government for Seafood. Former Ambassador to the Thai Government for Seafood. Author of "A Book About a Cook"